World famous San Francisco Bay Sailor, Superblogger and Serious Ocean Going Racer, Edward of EVK SuperBlog fame says, "That is a very good map. I tried it and have tattoo'd the spot on my right index finger where my boat lives." Perfect now I always have a map on ... hand ! Photo please - or it didn't happen. Wait a minute. Isn't that...yes, it is...from the Sistine Chapel. I'd just never seen it close enough before to read all of the saints' names. That Michelangelo WAS a genius. Mr O'Docker, it sounds like you're having a cannabinoid moment. It may be wise to avoid operating any heavy machinery just now. Do you have any Allman Brothers? This was far less obscure than that Oyster Bay Ed Norton Foosball Delamination thing, or whatever it was. Here's the fabled fresco from the Sistine Chapel ceiling - your typical 16th century, high Renaissance masterpiece. No big deal. In the vatican, these things are a dime a dozen. Here's a typical art history textbook close-up view, showing intricate brushwork, a masterful knowledge of human anatomy, and delicate interplay of light and shadow. Seen it, have the tee shirt. Notice though, that you still can't make out any saints' names. But ho, what's this? A seldom-seen, ultra-close view, revealing Michelangelo's true genius. 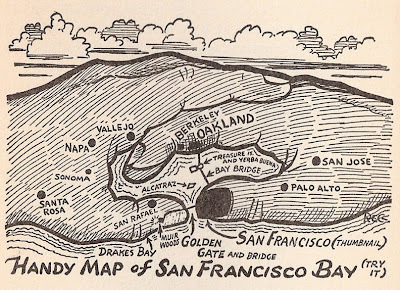 Beyond the brushwork, the anatomy, the light and shadow - there's a thoroughly useful map of San Francisco Bay. How very Renaissance! The perfect marriage of art and utility. Old Mich, though, couldn't help but acknowledge his patron, Pope Sixtus IV, (he knew which side of his palette was oiled) so he painted in some saints' names - Santa Rosa, San Jose, San Rafael. The real surprise for me though, is the spark between the two hands. I always thought that was a symbol of life being passed to Adam. I never guessed it was actually the Golden Gate Bridge. What did I know? What could I know? I'm sorry Mr Brokaw, I cannot allow my opponent's false assertion to go unchallenged. Michelangelo di Lodovico Buonarroti Simoni lived from 1475 to 1564. And the first European to enter san Francisco Bay was the Spanish explorer Juan de Ayala, who passed through the Golden Gate on August 5, 1775 in his ship the San Carlos. I think Mr O'Docker has lost his bearings. But we need to focus on the future, not the past. Mr O'Docker stands for four more years of the failed policies of the Medici administration. The American people deserve change. Can we do it? Yes we can.